The lovely little Piazzetta di Pontone, which I promised last week I would show you today, will have to wait another week. Today is a special day in Italy called Festa della Repubblica, or the Italian Republic Day, when Italians commemorate the June 2, 1946 vote that ousted the monarchy and established Italy as a republic. 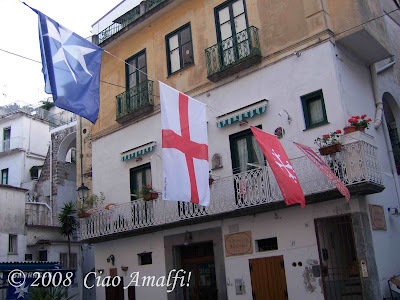 Cherrye over at My Bella Vita, one of my favorite southern Italian blogs, puts it well: “And they say America is young!” Today is also a special day for the city of Amalfi, which will be battling it out on the water this afternoon against its old rivals Venice, Pisa and Genoa. Why? 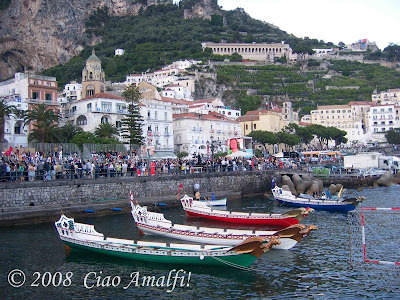 The photos is this post are from the Regatta in Amalfi last June. 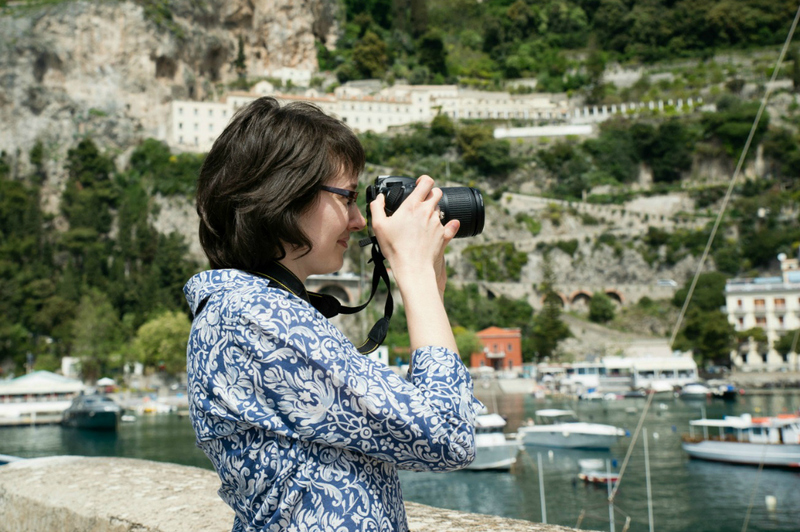 It is a fun time to be in Amalfi! The city is festooned with flags from the four cities, and everyone packs into the city to watch the historical parade and the race. 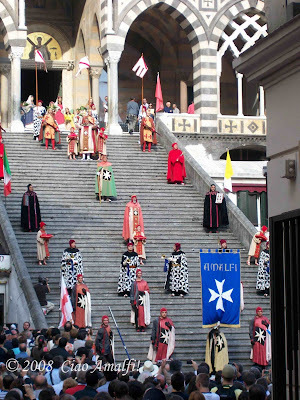 You can read in detail on the Comune of Amalfi’s website about the history and design of the elaborate costumes in the parade. 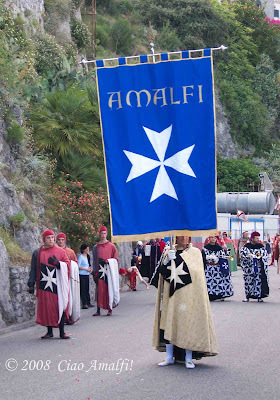 In Amalfi, the parade begins in Atrani and follows the road to Amalfi before going up the grand staircase to the Duomo of Amalfi. 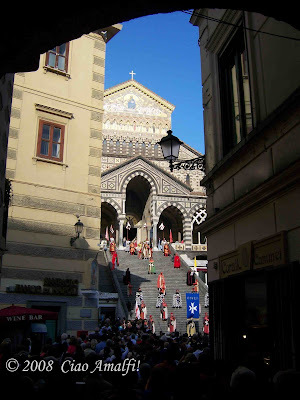 The most splendid part is when the procession exits the Duomo and returns down the steps. After the parade, everyone races down to the port to find a good spot to watch the race. 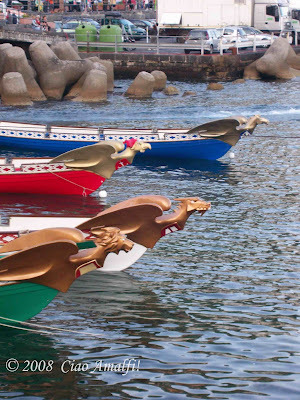 The 12th-century style boats are painted the traditional colors of each of the cities: Venice is green, Pisa is red, Genoa is white, and Amalfi is blue. Last year the Amalfi team encountered a problem during the race, and unfortunately came in last behind Venice, Pisa and Genoa. But it was still exciting to see! 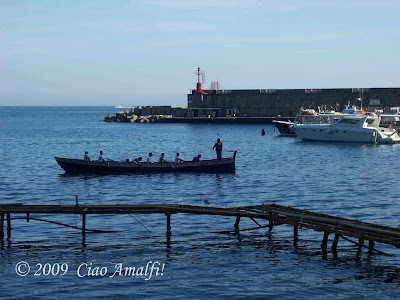 I have been watching the Amalfi team out practicing over the past month or so in the port. I snapped the photo below a couple of weeks ago when they were just heading out for practice one evening. 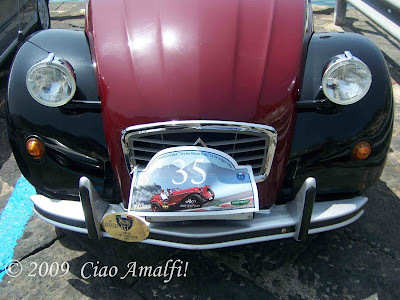 If you want to read more, the Comune of Amalfi has a nice website in English with information about the history of the Regatta. All my best wishes to the Amalfi team in Pisa today! 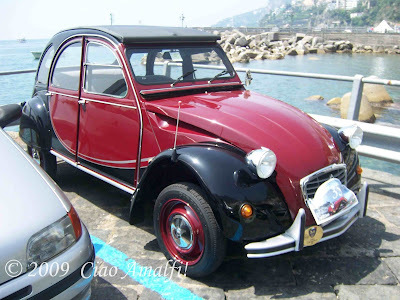 Go Amalfi! And buona Festa della Repubblica! It was a perfect sunny day on the Amalfi Coast yesterday for the Giro d’Italia, and I was happy that those watching the race around the world saw the coastline and Campania at its very best. Yesterday morning a light and refreshing breeze blew away the humid and heavy air of the past week. I arrived in Amalfi just as the riders were going through Maiori, but the crowds in Amalfi were already waiting. It wasn’t long before the police cars and scooters came through with their sirens and horns announcing the race would be arriving shortly. The first two riders, perhaps Facci and Krivtsov who broke away early, came through and got the crowd all excited. Shortly after, the rest of the riders came speeding through all at once. I couldn’t believe how fast! They arrived and less than a minute later they were gone. . .
After all the cars carrying extra bikes, tires, and the television crews went through, a van drove through announcing the end of the race. Within a matter of minutes traffic seemed to be flowing normally through Amalfi again. 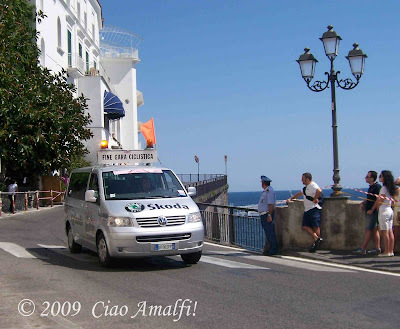 I was on foot, so I am not sure how much of a problem the Giro caused for traffic yesterday along the Amalfi Coast, but it seemed to be over quickly. By the time I arrived at the nearest bar with a TV, the riders were in Conca dei Marini already! With some time to spare, I headed down to the beach to enjoy the sun and the fresh breeze in Amalfi for a little while. Later, I watched the riders as they climbed Mt. Vesuvius to the finish line on the TV at the Gran Caffè, while enjoying a lovely glass of prosecco. Yes, I am definitely a new fan of the Giro d’Italia! You can read (in English) all about the day yesterday here at La Gazzetta dello Sport. Today is an exciting day for cycling fans on the Amalfi Coast. 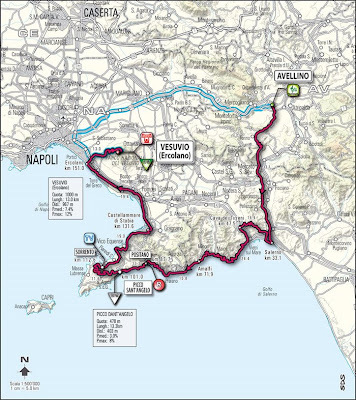 The 19th stage of the Giro d’Italia will take the riders today 164 km from Avellino down to Salerno, along the beautiful and challenging Amalfi Coast Road, over the mountains to Sorrento and along the coast until Mt. Vesuvius. What a ride! I have enjoyed the opportunity to learn more about the Giro d’Italia, and I am excited to watch it go through Amalfi this afternoon. If you are close to the route today, here is a schedule of the estimated times the riders will be going through the cities. 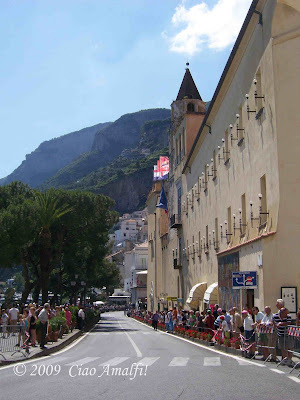 The action should be happening in Amalfi just before 3pm, and I will be there to cheer the riders on! Hopefully I will get some good photos and videos to post here this weekend. 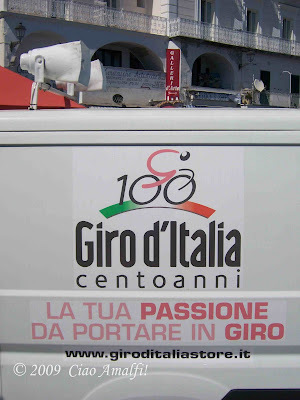 In the meantime, you can read about the Giro on the Amalfi Coast here at Positano News. Last weekend we were almost run over by a sudden race that went through Amalfi on Saturday. A car came through honking and and was followed shortly by more cars, scooters and then the riders. The video below doesn’t capture just how fast they were going, which is really a bad idea without any sort of crowd control in Amalfi. As soon as there were long gaps between the riders, people who just arrived and hadn’t seen what was going on would start to cross the street. Yikes! There was one incident, but it seemed like both the rider and the pedestrian were okay. Good luck today to all the riders as they make their way from Avellino to Mt. Vesuvius! 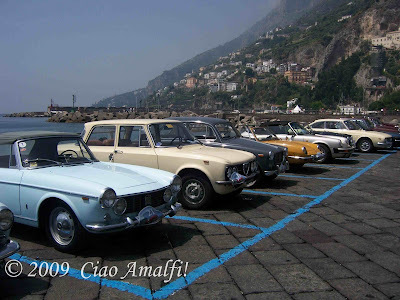 I was quite giddy last weekend when I stopped in Amalfi and found it full of beautiful classic cars! 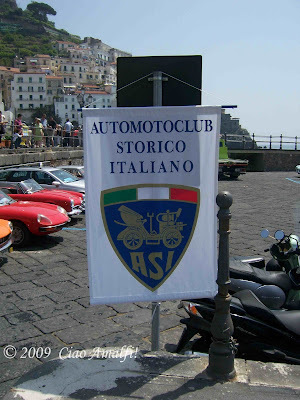 The Automotoclub Storico Italiano had stopped in Amalfi and took over the parking areas around Piazza Flavio Gioia during their Penninsula Sorrentina “Trofeo Marco Polo” from May 22-24th. So many beautiful cars! I wandered around in the hot sun trying to decide which one I would pick if I could. It is a fun game . . . 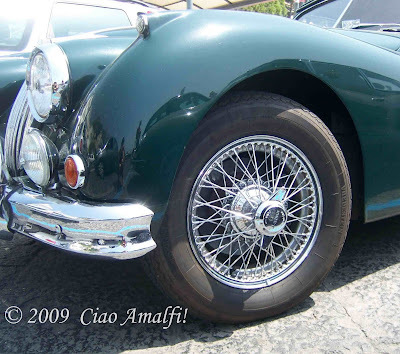 I have always been a fan of Jaguars, especially the wire wheels. road? Um, no, ma grazie lo stesso. 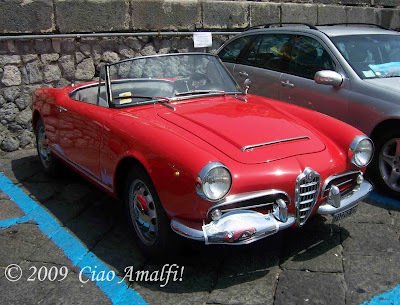 In the end I settled on this beautiful Alfa Romeo Giulietta Spider from the late 50’s. 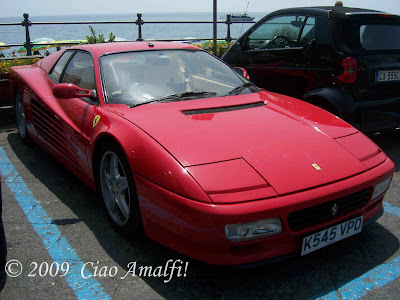 I decided it would be small and zippy enough for the Amalfi Coast road, and the convertible top was a must. Now that would be driving in style!